Life has gotten a little crazy, and I'm going to have much less time for crafting the original, well-thought-out content that you've all come to know and love (*cough*). 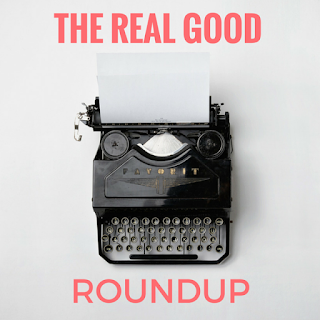 Thankfully, the fantastic book bloggers I follow put up oodles of excellent posts every week. This feature will help keep my blog rolling and serve as inspiration to dive into my Feedly reader every now and then, no matter how nutty the unread count gets. April of The Steadfast Reader fangirled over reverend and author Nadia Bolz-Weber and shared some of the best moments from the pastor's talk and their meet n' greet. The kicker? April is about as atheist as they come. The wonderful women over at The Socratic Salon got to talking about whether one can separate books from their authors. This is a subject I've hemmed and hawed over on my own, and I'm excited to see where the discussion in the comments goes. Alice of Reading Rambo reviewed Empire of Sin by Gary Krist and nerded out over the history of jazz and New Orleans. In typical Alice fashion, she packs excitement, intellectual geekery and snark into one neat package, complete with great GIFs. Arianna of Shelf Notes went on a whirlwind tour of the Pacific Northwest and squeezed in an impressive bunch of bookish sites along the way. I jotted down a few for the next time I head west. Amanda of The Zen Leaf is on a wellness journey and decided to blog about it. This week, she wrote about a time that she chose happiness for herself and how she can be her own worst enemy when it comes to doing the things that will bring her joy. It was a great reminder of the importance of making some decisions solely for our own fulfillment, without worrying about practicality or what others might think. The Estella Society is hosting the Dog Days of Summer Readathon, running September 18-20 (this weekend!). As per usual with the Estella clan, this is a no-rules, just-right kind of event: read what you want, when you want, and have fun doing it. After an exhausting week, I am definitely going to be participating.